Definition at line 245 of file bezierPatchMesh.cc. Referenced by OpenGLSurfaceEvaluator::bgnclosedline(), OpenGLSurfaceEvaluator::bgnline(), OpenGLSurfaceEvaluator::bgnqstrip(), OpenGLSurfaceEvaluator::bgntfan(), OpenGLSurfaceEvaluator::bgntmesh(), and OpenGLSurfaceEvaluator::mapmesh2f(). Definition at line 427 of file bezierPatchMesh.cc. Definition at line 223 of file bezierPatchMesh.cc. Definition at line 524 of file bezierPatchMesh.cc. Definition at line 252 of file bezierPatchMesh.cc. Referenced by OpenGLSurfaceEvaluator::endclosedline(), OpenGLSurfaceEvaluator::endline(), OpenGLSurfaceEvaluator::endqstrip(), OpenGLSurfaceEvaluator::endtfan(), OpenGLSurfaceEvaluator::endtmesh(), and OpenGLSurfaceEvaluator::mapmesh2f(). Definition at line 479 of file bezierPatchMesh.cc. Definition at line 290 of file bezierPatchMesh.cc. Referenced by OpenGLSurfaceEvaluator::coord2f(), and OpenGLSurfaceEvaluator::mapmesh2f(). Definition at line 551 of file bezierPatchMesh.cc. Definition at line 66 of file bezierPatchMesh.cc. Definition at line 75 of file bezierPatchMesh.cc. Referenced by bezierPatchMeshListDelete(), OpenGLSurfaceEvaluator::bgnmap2f(), and OpenGLSurfaceEvaluator::endmap2f(). Definition at line 542 of file bezierPatchMesh.cc. Definition at line 515 of file bezierPatchMesh.cc. Definition at line 347 of file bezierPatchMesh.cc. 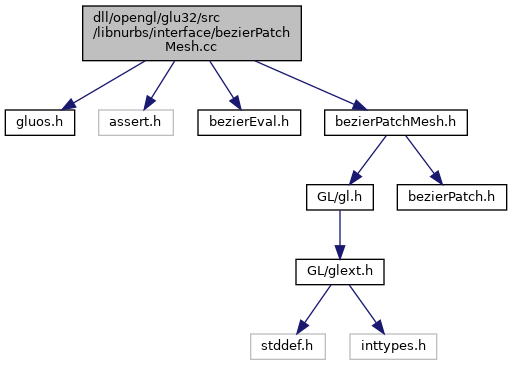 Referenced by bezierPatchMeshListReverse(), and OpenGLSurfaceEvaluator::map2f(). Definition at line 385 of file bezierPatchMesh.cc. Definition at line 354 of file bezierPatchMesh.cc. Definition at line 85 of file bezierPatchMesh.cc. Definition at line 363 of file bezierPatchMesh.cc. Definition at line 374 of file bezierPatchMesh.cc. Definition at line 100 of file bezierPatchMesh.cc. Definition at line 152 of file bezierPatchMesh.cc. Definition at line 396 of file bezierPatchMesh.cc. Definition at line 326 of file bezierPatchMesh.cc. Definition at line 183 of file bezierPatchMesh.cc. Definition at line 48 of file bezierPatchMesh.cc. Definition at line 597 of file bezierPatchMesh.cc.